Today at the Kirkus Book Blog Network, I chat with author/illustrator Matthew Cordell about his brand-new picture book, hello! hello! That link is here, and if you like this book as much as I do, come back next week for even more from Matt, including art, early studies, and jacket sketches. Tomorrow morning, I’ll have a column about Mary Logue’s Sleep Like a Tiger, illustrated by Pamela Zagarenski. That link will be here. 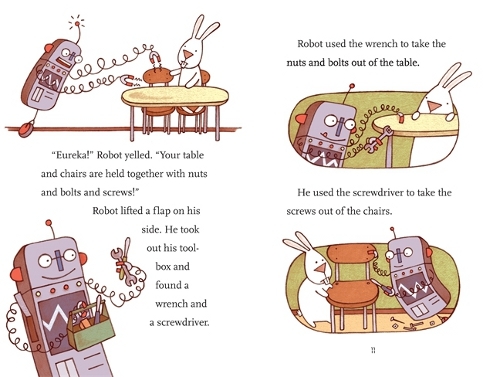 Last week, I wrote here about Cece Bell’s new chapter book, Rabbit and Robot. Today, I’ve got a bit more art, and she’s visiting to share things like pages from discarded chapters and other early drawings — or what she calls the “Top Secret Super-duper Rabbit & Robot Never-Before-Seen Conglomerate of Glory! That is to say, Rejected Stuff.” I thank Cece for stopping by. 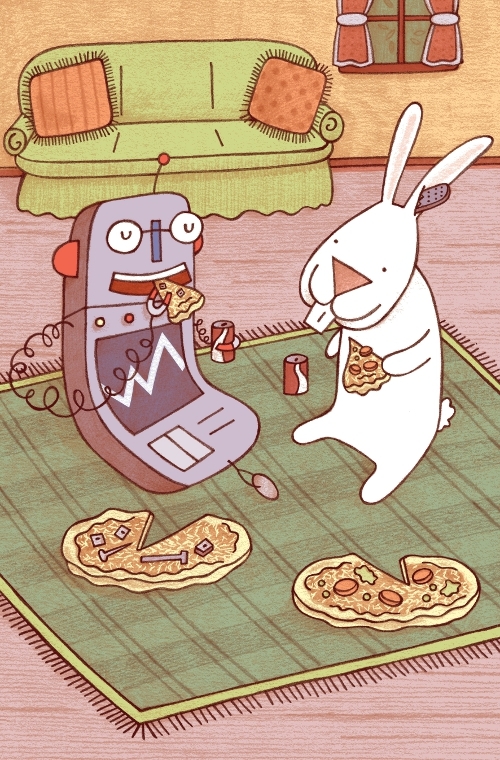 Cece: I am a lot more like Rabbit than I am like Robot. … “Wound tight,” is how my mother would describe me. But guess who I got that from? Thanks, MOM. This book was my attempt to be a smidgen like Arnold Lobel, who is arguably still the greatest chapter book writer and illustrator of all time. He brought some really interesting psychological things into his work that really make you want to linger over his books longer. 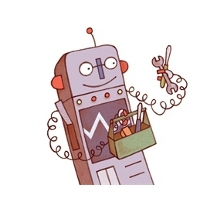 Even the illustrations, though a combination of hand-drawn stuff and computer stuff, were sort of created with Lobel in mind. There’s one author/illustrator that I really, really wish I could have met. These other pages are part of a rejected chapter, in which Rabbit and Robot decide to pretend to be characters from Rabbit’s favorite TV show, Cowboy Jackrabbit. This is totally based on my childhood, as my best friend Martha Claytor and I would pretend that we were Laura and Mary Ingalls, and we’d re-enact scenes—not from the books, mind you, as we were not that literary—but from the TV show starring Melissa Gilbert. On Melissa, buck-teeth were cute. On me? Not so much. Many, many, many bowls of homemade Prairie Dirt Soup later, I am still alive to tell you that I was kinda fond of the final spread in this rejected chapter, so it was a real case of “murder your darlings” when my editor suggested we get rid of it. But now I can share it with all your readers! And it probably was the right choice in the end. 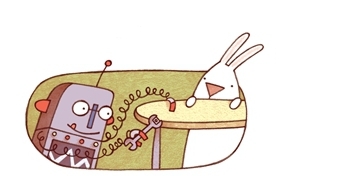 RABBIT AND ROBOT. Copyright © 2012 by Cece Bell. Final illustrations reproduced by permission of the publisher, Candlewick Press, Somerville, MA. All other images reproduced with permission of Cece Bell. Great post, Jules and Cece. 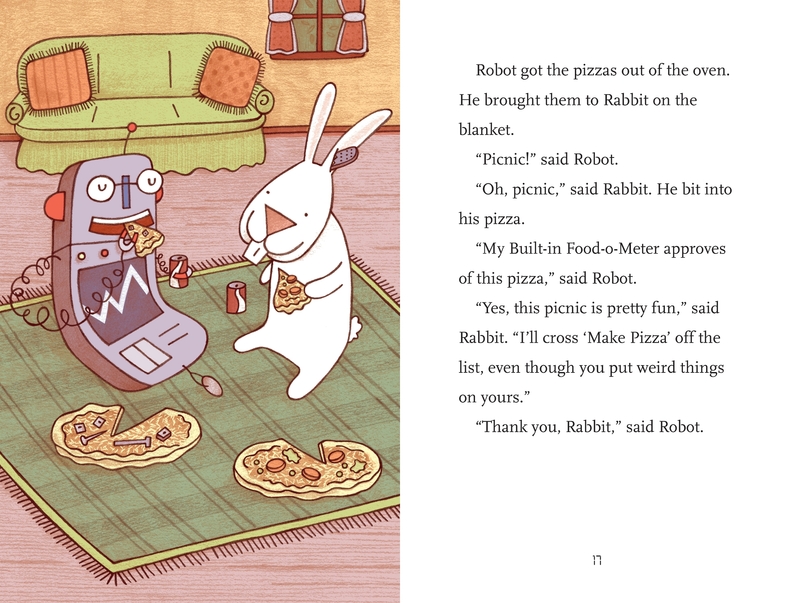 When you enjoy a book like Rabbit & Robot The Sleepover, it’s so much fun to get the inside scoop on the process. Thanks to you both. Beautiful, beautiful, wonderful, amazing blog. How do I “follow”…?